Director Leila Djansi has raised the cross bar to a much higher standard for producers and directors in the Ghanaian movie industry. The movie going public no longer has to settle for the mind numbing mediocrity that has characterized Nollywood products for so long. Djansi’s psycho-drama, “Sinking Sands,” attacks the difficult social topic of spousal abuse in a very direct fashion. On Saturday evening this left the audience at the VIP Special Viewing uncertain and uncomfortable in their response. The movie begins by depicting ordinary everyday village life and then proceeds to demonstrate the effects of spousal abuse in very graphic form. Members of the audience recognized themselves or close loved ones as perpetrators and/or victims and they responded with nervous twitters at inappropriate times to intensely dramatic scenes. Director Djansi had succeeded to move her audience. Djansi wrote the script and directed and produced the movie, shooting it all in Ghana with a predominantly Ghanaian cast and crew. Well known television personality, Ama K. Abebrese, and actor Jimmy Jean-Louis are in starring roles. This movie will inspire all Ghanaians who are interested in reviving the Ghanaian film industry – “Sinking Sands” demonstrates clearly that Ghana can produce a world class product. 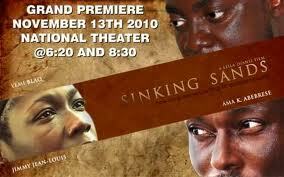 “Sinking Sands” premieres at the National Theatre this Saturday, November 13. Be sure that you are there.